Despite the fact that my family is from London, and I was born there, I’ve never been to Greenwich. This means I’ve never seen the Royal Observatory or the Greenwich meridian, even though it is, quite literally, the centre of the world. Kind of. Anyway, last weekend was a good time to put this right, as the Royal Museums Greenwich are holding an exhibition to celebrate the 300th anniversary of the Longitude Act. If you haven’t been already, I strongly recommend a visit before the exhibition ends on 4th January 2015. It’s the first time that all five of John Harrison’s timepieces are on public display together. Sailing in the 18th century was a hazardous business, and poor navigation often resulted in longer journeys or even shipwreck, as with the Scilly disaster of 1707. 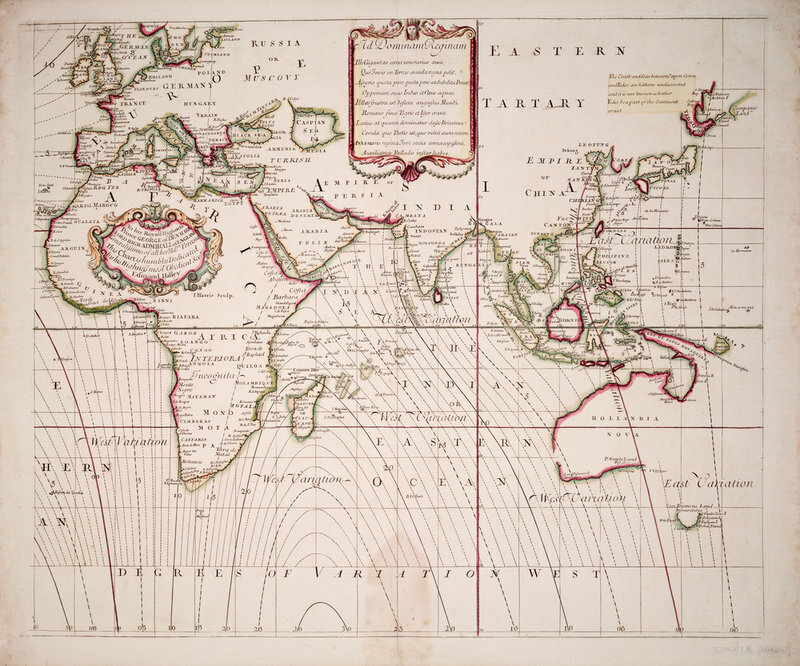 The main difficulty was determining a ship’s position while at sea; establishing latitude was fairly straightforward, by measuring the angle of the sun over the horizon at midday, but longitude proved more of a challenge. The most common method was to use dead reckoning – basically to follow a bearing and assume that you haven’t been blown off course by the wind or tides. The government decided to start a competition to solve the problem and passed the Longitude Act of 1714, which established the Board of Longitude, who would award a prize of up to £20,000 to whoever could come up with a method of determining longitude at sea. Five methods emerged as contenders, most of which used time to determine longitude. Given that the sun moves through 360° every 24 hours, that’s 15° every hour. So, if you are 15° W of Greenwich, it will be midday one hour later. The local time can be determined by seeing when the sun is at its apex (i.e. midday), so it follows that if you know the local time and the time at Greenwich, you can work out how many degrees of longitude you have travelled. So, how do we know the time in Greenwich when we have been at sea for weeks or months on end? Clocks of that period were unreliable and could not keep time during a long voyage. Probably the least plausible method was to set up an array of signalling stations that would send up a rocket at regular intervals, say every hour. The idea was that sailors would hear the signal and recalibrate their onboard timepieces. Also, the time difference between seeing and hearing the flare would allow the distance from the signal to be calculated. The problem with this method is the difficulty of maintaining the position of ships at sea, making sure the signals were released at the right time, and the reliability of ordnance. Would the rocket reach the right height, or explode too early? Unfortunately, the Earth’s magnetic field changes over time and has too many local variations for this method to be of any use. The idea of using lunar or solar eclipses to determine time had been considered before, but these events were too infrequent to be of much use. However, when Galileo discovered in 1610 that Jupiter had four moons that disappeared behind the planet and reappeared at regular intervals, he realised that this method had some potential. He attempted to persuade first the Spanish, then the Dutch government to produce telescopes and train navigators to make the observations, but he was unsuccessful. Even one hundred years later, improved technology could not make instruments accurate enough to view a small object like Jupiter from the deck of a moving ship. This method did prove to be very effective though for establishing longitude on land and was used well into the 18th century. If Jupiter’s moons were difficult to observe, a method requiring observations of our own moon should have been much easier. The idea was that an angle could be measured between the Moon and a star, for example the pole star, giving a ‘lunar distance’. After consulting an almanac of distances – and also altitudes of the Moon and stars – for various places around the globe, the local time should be easily determined. However, the Moon’s motions are very complex and constructing such a table proved very difficult. 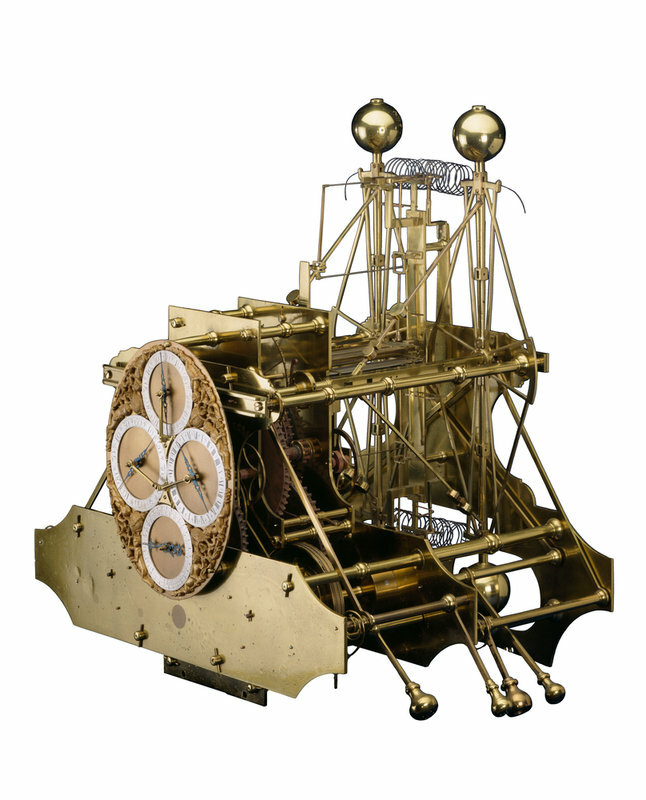 The most accurate clocks of the period incorporated pendulums, which were unable to function properly on a moving ship. Watches and smaller timepieces were too susceptible to heat and humidity to remain accurate over long periods of time. A young clockmaker from Lincolnshire, John Harrison, had started to experiment with using wooden components, which required no oil, yet were almost frictionless. Over the next few decades, he constructed a series of timepieces (H1-5, on display as the centrepiece of the exhibition), continually making improvements, but never quite doing enough to please either himself or the Board of Longitude. The clocks performed well over a number of sea trials, with, for example, Captain Cook referring to his ‘trusty friend’ and ‘never-failing guide’. Eventually, Harrison petitioned the Prime Minister, and after a debate in parliament, he was awarded £8750. I don’t think the exhibition made enough of Harrison’s struggles against the establishment, but nevertheless, it is fascinating and packed with information. There is so much more to see, as the institution is actually four museums on one site – hopefully I’ll have time to go and visit the rest of it before too long.